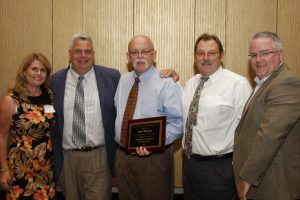 New Britain, CT, September 27, 2016: DATTCO, one of Connecticut’s largest passenger transportation companies, is pleased to announce that one of its veteran motorcoach operators, Mark Sullivan, was presented with Connecticut Bus Association’s prestigious “Motorcoach Driver of the Year” Award. The award was presented during Connecticut Bus Association’s annual dinner at Foxwoods Resort Casino on September 21, 2016. Mark, who has operated motorcoaches for 38 accident-free years, has driven more than 3 million miles over his career. His professionalism and customer service has made him one of the most requested drivers by DATTCO’s clientele. He’s driven famous dignitaries, government officials, professional and collegiate athletes, and tours groups throughout North America. Mark’s stellar safety record has given him the opportunity to work with DATTCO’s Safety & Training Program, where he assists with training and mentoring new drivers, as well as providing remedial training for seasoned drivers.